A malevolent Daedric entity long thought destroyed has resurfaced in the Velothi Mountains. Enter Champion's Rest and read the Vigilant's Report. Explore the dungeon until you come face-to-face with Umbra. Attack Umbra when he loses his invulnerability and take the Umbra Sword from his corpse. This quest will automatically begin upon installing the Umbra Creation. You will hear rumors of a Nordic ruin named Champion's Rest which has recently been uncovered in a silver mine east of Shor's Stone. The miners reportedly fled, and you are tasked with journeying there to investigate. 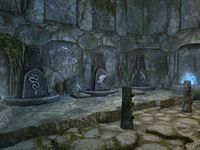 Upon entering the dungeon, you will come across a Vigilant's Report from a Vigilant of Stendarr who previously investigated the site after reports that the miners saw a ghost within the ruins wielding a whispering sword. The Vigilant identified the sword as Umbra, a sentient Daedric artifact long thought to have been destroyed. After reading the report, you will task yourself with finding the source of this dark presence to prevent any harm befalling Shor's Stone. After passing through the short silver mine, you will enter the Nordic ruins themselves Several skeevers can be found in a chamber to the left; to the right, you will enter a chamber only to come face-to-face with the ghost himself: a purple spirit who quickly vanishes. 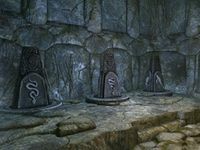 Venture deeper inside and you will find yourself is a huge chamber surrounded by sealed draugr sarcophagi and unlit blue braziers. At the opposite end of the chamber is a doubly-locked gate. Activating the nearby levers will do nothing. You will instead need to explore the two side passages, both of which contain spinning totem puzzles. Both side passages contain leveled draugr enemies. The totem solutions themselves are partially obscured, with one totem being almost totally hidden beneath rubble. The eastern chamber's solution is Snake—Hawk—Whale. Pull the nearby lever to activate the eastern braziers, but be careful as you will be hit by a dart trap if you select the wrong totems. Once one side of the chamber is lit up, you will be able to activate the corresponding lever to partially lower the gate. However, solving each puzzle will also release a wave of draugr from their tombs. The western chamber's solution is Snake—Snake—Whale, but again beware that the level will activate a flamethrower statue trap, which will ignite the surrounding oil slick if you haven't done so already. With both puzzles solved, the braziers on both sides of the main chamber will be lit by a cold blue flame and you will be able to fully lower the gate. 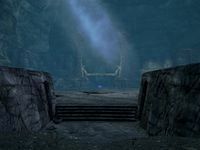 Progress further in and defeat the boss-level draugr (which may be a dragon priest at higher levels) and enter the second area of the ruins, Champion's Rest Amphitheater. The first section of the Amphitheater zone consists of narrow waterlogged hallways filled with various traps activated by hidden pressure plates. You will come to an open area containing oil lanterns; descend to the bottom level and continue onwards into the eerie blue crypts. You will again come across the ghost as you explore this area. At the end of the crypts, you will enter into a huge natural cavern featuring a rock-hewn gladiatorial arena. In the center of the arena, you will find the "ghost", who is in fact an ebony-clad Imperial warrior named Umbra. He is immune to all damage while purple and translucent, but he will repeatedly summon three soul images to fight you, during which time he will materialize and will be vulnerable to damage. Be sure not to allow the soul images to gang up on you, as two of them use bound swords and another will shoot from a distance with a bound bow. After a short period, Umbra will reabsorb his soul images and cast an extremely powerful area of effect Destruction spell, which includes frost and fire damage spells. Should you survive the boss fight and do enough damage to Umbra while he is not invulnerable, he will fall dead, allowing you to claim the sword as well as the Champion's Rest Passage Key granting access to his inner sanctum and a short escape route out of the dungeon. Taking the sword will end the quest. Loot the chest in the northeast corner of the arena and make your way to the southern exit. Inside Umbra's living quarters, you will find a small camp along with a bowl full of skeever tails and a Treasure Hunter's Journal explaining how the now deceased Imperial man had ended up in the tomb and how Umbra bent him to his will until their psyches fused. A secret tunnel will lead you back to the ruin's entrance, allowing for a quick escape. The name of this quest is a reference to Clavicus Vile, the creator of Umbra. The song that plays during the Umbra boss fight is "Daedra in Flight" from the Oblivion soundtrack.